Then I got married. And realized that I didn’t have a clue. Men are taught to be strong, brave, and always in control. Then you find yourself holding up a tiny little ring, like a five-year-old who found a prize in his cereal, asking a girl to take it and hold onto it forever. Now seven years in, my wife and I have learned a few things. While anything but “marriage experts” (find me someone claiming to be a “marriage expert” and I’ll find you a pathological liar), my wife and I have been asked to share our marriage story and insight in a marriage and parenting DVD series that we are flying across the country to film soon. 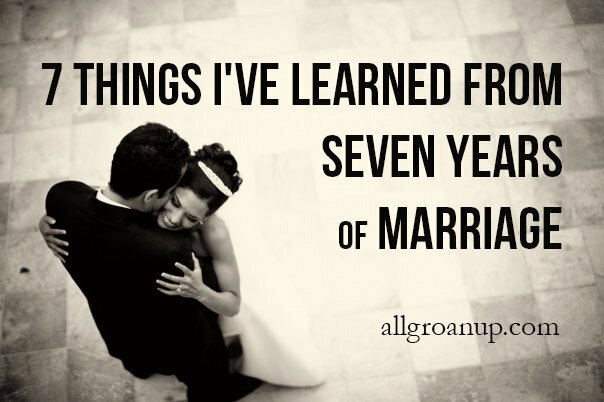 As we prepare and think back on our seven years of marriage, here are seven of the most important things we’ve learned. You need a vision for your marriage and family that you’re both working towards. Our goal was to create together. To join forces. To work together as if we were business partners as well as spouses. We wanted to create an organic, flexible life working towards something bigger than both of us, and doing it together. This hasn’t been a simple, straight-forward way to try and do life. There’s been many different seasons where we both had to be very comfortable with being very uncomfortable. There’s been times where I worked full-time and Naomi stayed home. Then seasons where Naomi worked full-time and I stayed home. And now, the vision we had that first year of marriage is a reality. We’re fully working and breathing and living smack dab in the middle of “Paul and Naomi Inc” – building our business together. And now with two more collaborators — a three and four year old. Whether you go as crazy full-tilt as us or not, one way or another: the most powerful part of your marriage is when it’s working together towards something bigger than your marriage. I remember the first few years of marriage I felt like we were just kids playing “House” and my dad was going to show up at any moment to take his business jacket off my shoulders. In a way we were playing house with just slightly different implications than when we were kids. There’s no textbook for husband and wife, no matter what new bestselling book tries to convince you otherwise. If it feels like you’re playing House, it’s because there should be healthy amounts of exploration, creativity, and unknowns that you’re trying to find solutions to. You grow into growing up as your roots grow deeper together. Marriage doesn’t happen at your wedding. Marriage happens slowly during the thousands of days thereafter. When shrapnel is flying all around. When bullets are whizzing at you both. When everything is fighting against your marriage, you must fight for each other. Your spouse must be your war-time ally. When the bullets start flying, will you protect each other’s backs or will you turn against each other? No matter the justification you deliver that verbal knock-out blow with, when your relationship is lying unconscious on the floor that doesn’t mean you’ve won. No, actually quite the opposite. Once your Verbal-Roundhouse Punch is thrown, it’s thrown. Just because you apologize and ask for it back, doesn’t mean your sledgehammer hasn’t already done its damage. Bonus Tip: When you’re 100% sure it’s their fault, it’s pretty much a guarantee it’s more your fault than theirs. You need other couples in your life you can all talk about your stuff with and realize that you’re not crazy. In marriage, especially when kids come, you can feel a littletadbit crazy. Some of the most helpful marriage resources we’ve ever received is being a part of different couple’s groups where people are open, honest, and encourage each other. Marriage is tough at times. Never talking about how tough it is, makes it that much harder. While it’s great to get input, advice, and wisdom, you can’t be constantly measuring your marriage by what other people think about your marriage, even especially from your own family. If you’re constantly looking to friends and family to tell you that you have a healthy marriage, or to consistently lament to them about everything what’s wrong with your marriage, then more things are wrong than you realize. Marriages don’t just explode, they slowly unravel. Day by day, life and time and to-do’s and struggles and hurts and strains and bad habits left untouched create rifts that grow over time. Yet, when a crash happens. When glass is flying everywhere. When you feel suspended in air, spinning, and you don’t know which way is up. The most important thing you can do is find each other, grab hands, and just hold on to each other. Keep searching for each other, even if you don’t know exactly where you’re headed. (For an epic image of this last point, check out this video from one of my favorites “M83” — from 5:18 – 5:54 is the part that really gets to me.